Harley is celebrating their 115 anniversary this year and from what we’ve seen so far - it looks like they are on a mission in 2018. 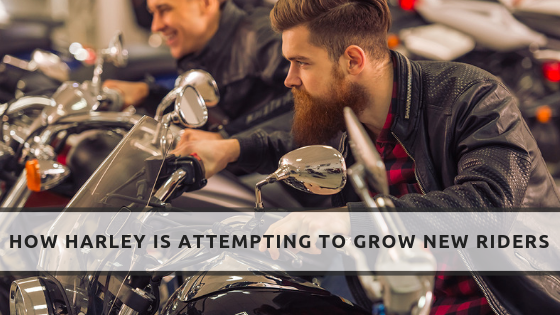 It’s no secret that the motorcycle industry as a whole is continually trying to gain new riders, but Harley has caught our interest with their recent plans. Back in July, Harley announced their accelerated strategy to build the next generation of riders globally - they’re calling it, “More Roads to Harley-Davidson”. The plan has three main points - introduce new products, give customers broader access, and create stronger dealers. Let’s unpack this new strategy and see what Harley is up to. With a new plan in place, Harley has revealed that they are rolling out new bikes to customers and are extending their leadership in heavyweight motorcycles. The company plans on developing more technology that will interest new riders and keep existing Harley riders engaged and riding longer. They also plan to break into Asia’s emerging motorcycle market by creating an easily-accessible, smaller displacement bike. Last but not least on the new product front, Harley plans on rolling out their first electric motorcycle, LiveWire, which has been recently unveiled - coming in 2019. But Harley isn’t stopping there, they also plan to add lighter, smaller, and more accessible electric models through 2022. We are eager to see how Harley’s dedicated fan-base reacts to the new electric models, and we are also interested to see if all of the additional new models attract more riders. As a part of this new plan, Harley also announced that they will advance their market delivery approach to meet today’s customer needs. How will they do that? Glad you asked. The company plans to give consumers broader access in three ways: creating high-engagement customer experiences across all retail channels, establishing strategic alliances with global leading e-commerce providers, and forming new retail formats including smaller, more urban storefronts. We can definitely see how this would successfully target a younger generation of riders and we hope it works. Last, but not least - Harley plans to implement a performance framework that will significantly enhance the strength of their dealer network and the customer service they provide. Harley’s dealer network is crucial to the company’s overall success and we think it’s a wise choice to invest in them. Harley’s plans sound strong - and we’re all for growing the motorcycle industry as well as new riders, so we hope this new strategy is a huge success for the company. We’re curious to see if other manufacturers will unveil new game plans - only time will tell. Do you think Harley’s revamped strategy will work? Drop us a line in the comments below.